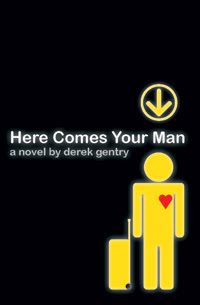 Derek Gentry: Amazon, je t'aime! Okay, so Amazon was a little slower than Barnes & Noble to start selling my book. And yeah, it hurt a little...I thought Amazon and I had something pretty special. 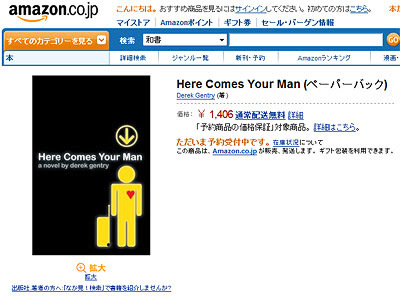 All is forgiven now though, because Amazon has not only started selling Here Comes Your Man in the US, they've also got it listed on their sites in the UK, France, Germany, and Japan! For the moment, there do seem to be some international supply issues—the French site lists the book as "temporairement en rupture de stock," which sounds extraordinarily painful. But still...it's exciting just to be listed. Hey, I looked inside! Not only that, I notice there is already a used copy of your book available for a 50% markup. Congrats! ... and as a side note, the option to comment as Name/URL doesn't want to work in FF 3.6.3, but will work in nasty old IE. Just thought you might want to know. Hey Todd, thanks so much for the Look Inside update--seeing it working makes me wayyy happier than it probably should! I really don't know what to think about the used copy or the other "new" copies on Amazon...that's just bizarre. I'll have to experiment with FF (my browser of choice as well). I did some "customizing" of this blogger template...I wouldn't be surprised if I broke a couple things along the way.